Arianna Jackson—AJ to her friends—and her occasionally well-behaved Alaskan Malamute, Nicoh, live a normal, uneventful, admittedly mundane existence, where nothing out of the ordinary ever happens. Early one morning, AJ stumbles upon a horrifying scene—a girl’s body lies broken in the dumpster behind her home, her face beaten and mutilated. As if that weren’t enough to upset the balance of normal, things go from bad to worse when she learns of her connection to the murdered girl. Suddenly, AJ realizes her entire life has been filled with secrets and lies. Together with her trusty sidekick, Nicoh, and BFF, Leah, AJ must search for answers. But can she, when finding the truth proves to be more deadly than living the lie? Would you search for the truth if you knew it could kill you? Join AJ and her pals as they race to unravel the mystery of her past, where the pieces of the puzzle bring more questions than answers and the only certainty is the killer’s end game—AJ’s life. 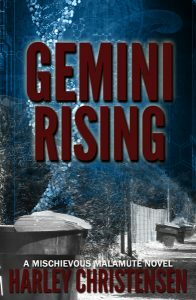 Grab your copy of Gemini Rising TODAY and join others who’ve enjoyed this suspense-filled page-turner that keeps you guessing to the end…and beyond. Honestly, the idea for the story came to me in a dream. I typically never remember them in the morning, so when this one woke me up, I knew I had to jot it down immediately. I was glad I did because I fell back asleep and when I got up in the morning, I'd forgotten it all! Imagine my surprise when I read my notes! Anyway, that was the beginning of Gemini Rising! You go through it believing you are a plain old Joe, or Jane, living a normal, mundane existence. The point being, you get up every day and do it all over again, because nothing out of the ordinary ever really happens. Here’s the kicker: Once in a while Life throws in a bit of mischief—kind of like the snarky little brother you wish you could permanently lock in his room, rather than those few cherished times you’ve gotten away with when Mom wasn’t looking—only much, much worse. And because you’re expecting the same old same old, you’re flabbergasted when Life punches you in the gut. As you crumble to the ground, gasping for air, you might have that notorious ah-ha moment. You know the one I mean. The one where you come to the realization the experience was your wake-up call—a reminder you’re alive and in control of your destiny—and to make the most of it. The cynic in me thinks it’s Life’s not-so-funny way of reminding you who’s really in control—the punch line being—you only think you are. Shortly after 4 a.m. on Tuesday, I woke to a start, realizing it was garbage day and I’d forgotten to set mine out. Again. It was late November and though it doesn’t get that cold in this part of the Southwest—certainly not like other parts of the country—the Saltillo tile was chilly on my feet as I jumped out of bed. Nicoh, my ninety-eight pound Alaskan Malamute—still on top of the bed and ever the helpful one—peered at me from under the blankets and pillows he managed to steal during the night, before returning to whatever doggie dreams he’d been having. Ugh. Someday I’d get my bed back. Today wasn’t going to be that day. The city’s garbage collection truck would arrive in ten minutes, so I grabbed the trash bag from the kitchen and opened the door. It was still dark outside but the moon hung lazily in the sky, providing a single source of light as I moved through the backyard and out the iron gate that led to the alley where I shared a dumpster with my neighbors. Except for the occasional hum of a passing car on the nearby street, it was silent. With my free hand, I wiped the sleep from my eyes and cursed myself again before tossing the lid of the dumpster, which as usual, was sticky and nasty. Just wonderful. I firmly grabbed the trash bag with both hands to toss it in, but stopped short when I noticed the smudgy reddish-brown imprint my hand left against the starkness of the white bag. I started to look more closely when a putrid metallic stench filled the air, forcing me to focus my attention on the open dumpster. I swallowed hard and tried not to breathe in too deeply as I looked over the edge, expecting to find a package of rotten meat or at most, a dead animal. I gasped in disbelief and shock at the horrific scene before me. A girl’s thin frame, clad only in a hot pink tank top and jeans, nestled among the trash bags and lawn trimmings. Her bare arms—flung above her head as if celebrating a touchdown—were a sharp contrast to her legs, which were bent in awkward, unnatural angles beneath her. Disturbing as her body was, her face told an even more vicious and sinister tale. No, there was no celebration. Someone had made sure of that when they erased whatever smile she’d had—the wrinkle her nose made as she laughed, the twinkle that glistened in her eyes—replacing it with a death mask of pulverized flesh and bone, rendering her faceless. Unrecognizable. Blood congealed in her hair, likely once long and lush, now matted and tangled into oblivion. Though sickened at the sight, an immense sadness came over me—who could be so cruel, so hateful—to end her life so violently? I clenched my fists as sadness turned to anger. The blaring horn of the garbage truck disrupted my thoughts. I dropped the forgotten trash bag as I swirled to face it and waved my arms frantically at the driver, who looked at me through his hazy window with disgust. I was clearly messing with his schedule. I ignored the profanities he barked in my direction and continued to flap my arms, begging him to stop. The worker pulled the brake on his truck, jumped out and joined me at the dumpster, probably doubting my sanity. After a whiff and an unexpected eyeful, he turned away and vomited loudly against my neighbor’s retaining wall. Several seconds later he coughed, pulled out his cell phone and called 911. I shook my head and for once, held my tongue.